Experiencing a wonderful year bring plenty of joy for Napoli coach, Walter Mazzarri, who really wants to continue this current path and keep leading his team growing even more in the next year. Almost leaving the club in the summer, Mazzarri now seems really content at the club and even thinking about becoming a long servant at the Partenopei just like Sir Alex Ferguson did at Manchester United. 2011 was a very important year for us, a year of growth and satisfaction. We are proud of what we have done and we want to continue on this road. My future? I have a contract with Napoli until 2013 and I intend to respect it. 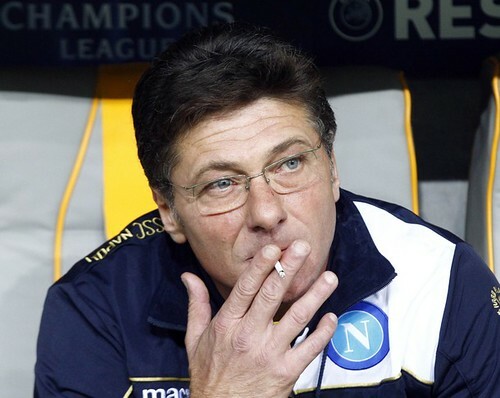 If there are clear ideas then I could become the Ferguson of Napoli.” Mazzari revealed. Obviously it won’t be an easy task for Mazzarri, as just like he said, if there’s a clear idea about what the future is for him and Napoli, the tactician won’t mind to continue there as long as possible but in Serie A things can really change in an instant. Few bad results can easily forced changes on the bench, that’s why the former Sampdoria coach, can’t really confirm anything about his future yet aside from the hope of finishing his current deal and leading the Naples into consistent success. Moreover, revealing about his team’s main focus in 2012, Mazzarri stated that doing well in the league is something they must neglect despite having a dream to keep going in the Champions League. The tactician warned his players that in order to keep competing in the highest European competition they must improved their position in the league, since starting from next summer there will only be three representatives for Serie A in Champions. Their inconsistent form in the league is pretty much connected with their European commitment, with the competition getting into a much more difficult phase, the Partenopei obviously must improve their consistency to do well in both competitions. Napoli players must obviously aware that it won’t be easy to grab a Champions League sport for next summer with many teams are looking very strong this season. “Scudetto or Champions League? To continue the adventure in Europe would be great, but we cannot forget the League. To reach the Champions League we have to reach a clear position in the League. It will not be easy but we will believe in it until the end,” Mazzarri stated.